November 1, 2018: The Salisbury Symphony today announced the start of their “Annual End-of-Year Fund Drive” to support Symphony programs in the 2018-19 year, with a stated goal of $100,000. This year’s Fund Drive will be led by newly retired Chief District Court Judge Frank Montgomery, who has just moved back to Salisbury. Montgomery has the distinction of being a member of the Symphony Board in 1974 when the organization’s original incorporation papers were filed with the State. The Fall is always a busy time for the Symphony, and this year is no exception. “Jazz Night” is planned for November 10th at Varick Auditorium on the Livingstone College campus, and of course, the “Nutcracker” Ballet, a performance of the Piedmont Dance Theatre in partnership with the Salisbury Symphony, returns each December to delight young and old alike (this year it will be presented December 15th and 16th at Keppel Auditorium). The Spring’s concert lineup includes a January event called “Stars,” programmed especially for families and children, a special performance in March by pianist Solomon Eichner, and a concert highlighting the music originating in the Appalachian Mountains featuring NC State Folk Music Award winner Matthew Weaver and his bluegrass band. In addition, the Symphony’s education programs for school-age youth are in full swing, with after-school strings programs, a youth orchestra and an elementary-school miniconcert series all currently funded through the Salisbury Symphony. The Salisbury Symphony is a 501(c)(3) nonprofit organization and donations are tax-deductible to the full extent of the law. Tickets to events and more information about our programs can be found on the Salisbury Symphony website at www.salisburysymphony.org or by calling the Symphony Office at (704) 216-1513. Credit cards are accepted. For more information, contact us at staff@salisburysymphony.org. On Thursday, November 8, the Salisbury Symphony Guild invites Salisbury’s cool cats to find their rhythm at All That Jazz!, an entertainment happening reminiscent of a visit to New York’s historic Village Vanguard jazz club. 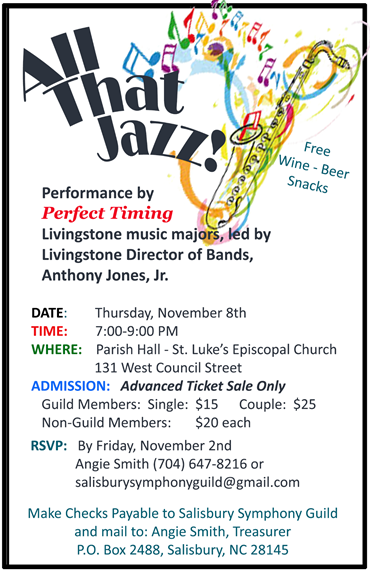 Comprised of Livingstone College music majors and led by Livingstone College Director of Bands, Anthony Jones, Sr., the quartet has become a favorite at parties and events in the area since its inception last year. Its modern jazz repertoire ranges from Duke Ellington and Benny Goodman to Miles Davis, John Coltraine and other legends. Admission is by advance ticket sale only: $15 for a single Guild member, $25 for a Guild couple, and non-Guild members $20 each. Free-flowing beer, wine, soft drinks and bar snacks are included. RSVP by e-mail to salisburysymphonyguild@gmail.com or by phone no later than November 2 to Angie Smith, Guild Treasurer, 704.647.8216 or Ann Meredith, Guild past-president, 704.645.8300. Checks to Salisbury Symphony Guild, P. O. Box 2488, Salisbury, NC 28145. Credit cards will be accepted. Established in 1977, the mission of the Salisbury Symphony Guild is to promote and support the Salisbury-Rowan Symphony Society and its music education opportunities. This mission is carried out through financial gifts, fund-raising events, support of education programs and promotion of the Symphony in the community. Learn more about the Guild at https://www.salisburysymphony.org/guild or 704.216.1513. The Salisbury Symphony Board of Directors last night approved the appointment of William M. “Bill” Bucher, Jr. as Executive Director for the Symphony effective October 1, 2018. Bucher has been serving as Interim Director since May, when he agreed to handle administrative duties while the Board conducted a search for a permanent Executive Director. Bucher is a twenty-five year resident of the Salisbury area. He was the chief financial officer of the Rowan-Salisbury Schools for ten years from 1992-2002; he then served as chief financial officer of the Winston-Salem/Forsyth County Schools until he retired from the State in 2013. Bucher has a Bachelor of Science degree in Business from Wake Forest University and a Master of Arts degree in Political Science from Appalachian State University; in addition he holds a certificate in City/County Government from the NC Institute of Government in Chapel Hill. Bucher and his wife Gayla have two grown daughters with families of their own in Austin, Texas and Lanham, Maryland. The Salisbury Symphony, led by David Hagy, is one of only a few professional symphonies in North Carolina and is headquartered in the Gateway Building in downtown Salisbury. More information, including concert schedules, can be found at www.salisburysymphony.org. On Oct. 6 the Salisbury Symphony will be performing a concert of American music whose title feature will be a work by one of the most prolific American composers living today, a musician whose specialty is the fiddle but whose work deftly crosses the boundaries between classical, jazz, western, folk and many other genres of music. And he lives near Lake Norman in North Carolina! Mark O’Connor is widely acknowledged as a master fiddler, but his incredible array of musical interests have led him in at least a hundred different directions. On his website he calls himself “an Americana, bluegrass, blues, classical, country, folk, jazz artist.” Even so, you might get the feeling that O’Connor would rather not limit himself even to this long list of descriptive terms. O’Connor’s compositions have been played by internationally famous musicians as diverse as cellist Yo-Yo Ma, opera singer Renée Fleming and country music singer Rosanna Cash. His work has also been performed by the London Philharmonic Orchestra, the Metamorphosen Chamber Orchestra, the Chicago Symphony and the Colorado Orchestra, among others. The “Mark O’Connor Band” — his latest musical project, composed mostly of members of his family — has performed at the Grammy Awards Premiere Ceremony, received standing ovations at the Grand Old Opry and their debut album, “Coming Home,” reached the No. 1 spot on Billboard’s Top Bluegrass Albums chart. In 2017 the band was invited to open for the Zac Brown Band’s 2018 summer tour. Also on the program will be a soprano soloist whose name will be familiar to those who attended the Symphony’s performance of “The Messiah” last December… the bubbly, irrepressible Anyeé Farrar, who will be performing Samuel Barber’s “Knoxville: Summer of 1915.” Currently in her first year at the College-Conservatory of Music, University of Cincinnati, she graduated just last year from the North Carolina School of the Arts in Winston-Salem and while she was there she was a member of the choir at First United Methodist Church in Salisbury. So this event will feel “a bit like coming home” to her. Though she is young — just 22 years old — and somewhat petite in stature, Farrar’s singing packs a surprising punch. She has a particularly confident and fresh delivery, a voice that even non-opera lovers will find moving and inspirational. Farrar’s interest in opera began in high school at the Governor’s School for the Arts in Norfolk, Virginia. At the University of North Carolina School of the Arts she was named a Fletcher Scholar and awarded a scholarship reserved only for exceptional undergraduates. Most recently, Ms. Farrar was seen on the main stage of the Stevens Center performing the role of Clorinda in Rossini’s La Cenerentola and Edith in Gilbert and Sullivan’s Pirates of Penzance. Locally she has been featured as the soprano soloist in Bach’s Cantata 80 and Handel’s Messiah, both with the Salisbury Symphony Orchestra. Ms. Farrar will perform “Knoxville: Summer of 1915” by American composer Samuel Barber (1910-1981). Barber adapted excerpts from the poems of James Agee, who wrote of the last summer evenings of his childhood in Knoxville, the idyllic year before everything changed for Agee and his family. Agee’s father was tragically killed in a car accident the following year, forever changing the poet’s life; the family left Knoxville, never to return. Also performing on Oct. 6 will be the newly formed Salisbury Symphony Chorale in just their second year of existence. The Chorale will perform Robert Maggio’s “I Hear America Singing,” inspired by the poem of the same name by Walt Whitman, as well as selections from Randall Thompson’s “Frostiana,” a work which is based upon the poetry of Robert Frost. Starting to see a bit of a pattern here? And creative they are. Though it was inspired by the original longtime National Public Radio show “The Prairie Home Companion,” the production is all-original and purely local, using local talent and poking good-natured fun at Salisbury and the people and places that make it special. “Kent just has the funniest way of expressing himself,” says Kay Peeler, pretending for a moment that Kent isn’t sitting just across from her at the table. She and Kent are the creative forces behind scripting the show and arranging the many musical and comedic talents that will be showcased on August 25th. Kent replies with a mock-serious face. “It’s not always intentional, I assure you.” But with a formidable array of musicians and performers and a script that sends the planning committee into uncontrollable giggles even after reading it several times, the two writers know they’ve got a true hit on their hands. The show picks up on some of the original show’s familiar characters and punchlines - “Guy Noir,” “Tales from the Choir Loft” and “Lives of the Cowboys” – and yet still manages to find the common threads that bind all of us who live in or near “The Bury” together. The Sevierville, Tennessee gospel harmony group “Fortress” will also make their debut Salisbury performance at “A ‘Bury Home Companion.” The group recently released a new song “Tell The Mountain (About Your God)” which is now playing on East Tennessee gospel radio. Singer-songwriter Danny Basinger from Gold Hill will also lend his vocal talents to the performances. Woven into the show are short homespun stories and anecdotes about some of Kent’s Salisbury experiences – often voiced in dramatic fashion by a cast of hilarious local comedic talent - featuring many of the unique, timeless things that make Salisbury such a special place to live, work, and talk about. You’ll love it! Choose from two performances of “A ‘Bury Home Companion” on Saturday, August 25th at the Meroney Theatre at 213 S. Main Street in Salisbury: Matineé show at 2:30pm; evening show at 7:30pm. Tickets for both performances are still available and are on sale now at www.salisburysymphony.org. Adults: $45, Seniors 60+ $44 each. The Salisbury Symphony is pleased to announce the addition of local music teacher Beth Cook as our part-time Education Director effective August 2nd. Her responsibilities will include supervising the Symphony’s After-School Strings Program, the Salisbury Symphony Youth Orchestra and other youth and education-oriented programs sponsored by the Symphony. Ms. Cook is in her 27th year with Rowan-Salisbury Schools, teaching chorus at Charles C. Erwin Middle School. She holds a B.A. in Music Education from Pfeiffer University, an M.M. from the University of North Carolina at Greensboro and is National Board for Professional Teaching Standards certified. She lives in Salisbury and enjoys reading, gardening and spending time with her grandchildren. For more information contact the Salisbury Symphony Office at (704) 216-1513 or e-mail us at staff@salisburysymphony.org. Following last year’s sold-out performance, The Salisbury Symphony has announced “A Bury Home Companion” will return to the Meroney Theater August 25th, this year with two shows - a matinee at 2:30pm and an evening performance at 7:30pm. Designed as a fund raiser for the symphony, the show is inspired by NPR’s long-running “A Prairie Home Companion”, spotlighting the gentle, humorous side of life in Rowan County. Show host and writer Kent Bernhardt is once again teaming with music director Kay Peeler to produce the show, written as a live radio program “that has been around for 30 or so years each Saturday night, live from the Meroney stage”, says Bernhardt. The show features a host of familiar faces performing as “The Bury Home Companion Radio Players”, including Sara Lee, Dan and Winnie Mikkelson, Alice Rich, Mary Ann McCubbin, Buddy Farnan, Linda Jones, Russ Stevens, and show announcer David Whisenant. The cast performs comedic radio ads for sponsors, and gets to stretch their vocal talents in classic Bury Home Companion features like “Guy Noir”, “Tales from the Choir Loft”, and “The Lives of the Cowboys”. Musicians Sara Claire King and Eli Yacinthe, a popular duo in last year’s show, will return and will be joined by country star Rockie Lynne, The Moonglows (appearing as the Bury Home Singers), gospel performers “Fortress”, Gold Hill singer-songwriter Danny Basinger, and the Bury Home Companion Band under the direction of Vivian Smith Pennington. Lynne has made national media appearances on “Good Morning America” and “Fox and Friends”, and has appeared many times on the stage of the Grand Ole Opry. He is the founder of a national charitable organization Tribute To The Troops, now in its 15th year, and was recently tapped to be the host of the home remodeling program “Operation Build” which airs nationally on A&E Network. The production is presented by Livingstone College, along with Wallace and Graham, Catawba College, F&M Bank, K&K Productions, Mean Mug, John and Pam Schaffer, Salisbury the Magazine, and Laura Lewis Photo. All money raised goes to the Salisbury Symphony to help bring quality music and music education programs to the region. Tickets are available online at salisburysymphony.org, or by calling the symphony office at 704- 216-1513. The Salisbury Symphony Organization is announcing that it has formed a search committee in order to find a new Executive Director. The Organization is looking for an individual who has the ability to assemble an effective staff, work effectively with board and community members, and collaborate with artistic personnel to ensure the integrity and growth of orchestra programming. All interested applicants may send a cover letter and resume to apply@salisburysymphony.org . Resumes will be accepted through June 29, 2018. For a full job description please visit www.salisburysymphony.org. The Salisbury Symphony Chorale and Music Director David Hagy will present “Disney Magic, An Animated Choral Experience” at St. John’s Lutheran Church on Saturday, May 26th at 6:30pm. John Stafford, Director of Music Ministries at First Presbyterian Church in Salisbury, will be the Guest Conductor. The program will feature a collection of popular Disney film hits from movies like “The Lion King,” “Cinderella,” “101 Dalmations,” “Toy Story” and “Pocohantas.” The first half will feature the choir a cappella while on the second half they will be joined by a jazz trio. Tickets will be available at www.salisburysymphony.org or at the door. Tickets: Adults: $15.00 each; 18 and under only $5.00 each. St. John’s Lutheran Church is located at 200 West Innes Street in Salisbury. For more information call the Salisbury Symphony office at (704) 216-1513. 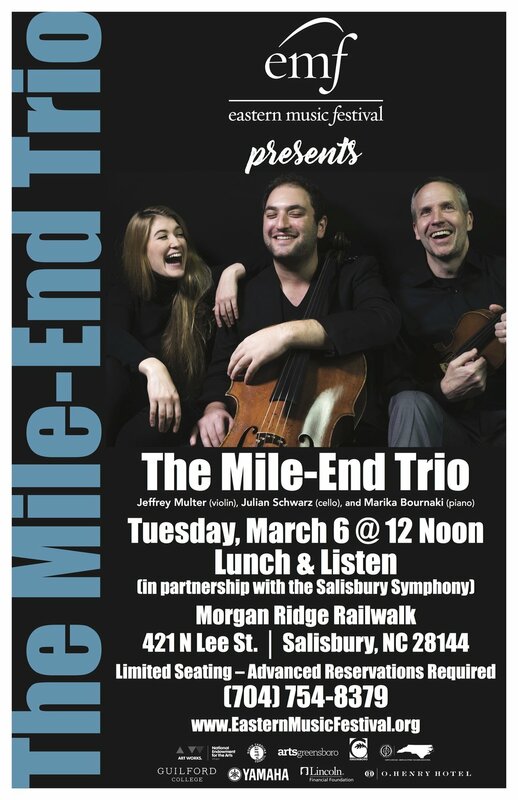 The Salisbury Symphony is pleased to announce an artistic collaboration with Morgan Ridge Railwalk, joining forces to host acclaimed ensemble, the Mile-End Trio in a lunchtime performance on Tuesday, March 6th at noon. This performance of the Mile-End Trio is part of a multi-state tour produced by the Eastern Music Festival. Morgan Ridge Railwalk, at the heart of Salisbury’s Arts District, will be opening especially for this event on Tuesday, March 6th from 11.00am, offering popular lunch selections including their famous locally-sourced beer mash-fed burgers, in addition to their own beer and wine selections. Space is limited for the Lunch & Listen, bookings can me made via 704 754 8379. The Mile-End Trio is made up of award-winning musicians Jeffrey Multer (violin), Julian Schwarz (cello), and Marika Bournaki (piano). Multer, a Jullliard graduate, has been praised across the world for his passionate performance in esteemed venues such as Lincoln Center, the Kennedy Center, Carnegie Hall, Weill Hall, Merkin Hall and the National Gallery in Washington, D.C., the Mozarteum in Salzburg and the Rudolphinium in Prague. Schwarz, who made his professional debut at age 11 with the Seattle Symphony, has toured internationally as a soloist, recitalist and chamber musician, and has won 1st prize in the professional cello division of the Schoenfeld International String Competition in Hong Kong, and also won 1st prize at the Boulder International Chamber Music Competition’s “The Art of Duo” with fellow Mile-End Trio musician Marika Bournaki. Bournaki has appeared as guest soloist with the Quebec Symphony, Yannick Nézet Séquin’s Orchestre Métropolitain, Montreal Symphony, Timisoara Philharmonic, St. Petersburg Symphony, Verbier Chamber Orchestra, among others and has also performed recitals at the Friends of Chamber Music Denver, Palais Athénée in Geneva, Onassis Cultural Centre in Athens, Festival del Sole in Napa, the National Arts Center in Ottawa, Chamber Music Northwest in Oregon, the Luminato Festival in Toronto and a benefit recital for the Glenn Gould Foundation at New York’s Carnegie Hall. For more information on the Salisbury Symphony visit: www.salisburysymphony.org. Salisbury Symphony presents THE NORTH CAROLINA SYMPHONY IN CONCERT! 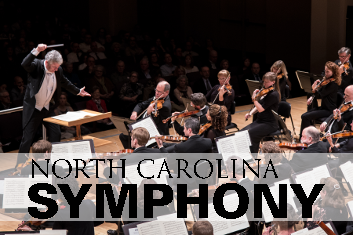 The Salisbury Symphony proudly announces the return of the North Carolina Symphony to our community for a special concert, which will take place on Thursday January 18 at 7.30pm at Keppel Auditorium on the campus of Catawba College. For over 35 years the Salisbury Symphony has presented an annual guest concert by the North Carolina Symphony; the only city in our region that hosts the state’s official orchestra. This year’s concert will feature Beethoven’s 4th Symphony, Bizet’s Suite from Carmen, Tchaikovsky’s Waltz from Eugene Onegin, Gershwin’s Overture to Girl Crazy, Shostakovich’s Festive Overture Op. 96, and Gimenez’s La bada de Luis Alonso. The North Carolina Symphony will be led by one of the hottest new conductors in the US, Wesley Schulz. Schulz made his Seattle Symphony debut in a sold-out performance with singer/songwriter Gregory Alan Isakov, led seven world premieres at the Merriman Family Young Composers Workshop, and assisted with recordings for the symphony’s Grammy-winning label, Seattle Symphony Media. He has also led numerous orchestras across the US including Bainbridge Symphony Orchestra, Britt Festival Orchestra, Texas Chamber Group, Austin Symphony Orchestra, The Venice Symphony, Grand Junction Symphony Orchestra, Auburn Symphony, and the Juneau Symphony. www.salisburysymphony.org or call 704 216 1513. SALISBURY SYMPHONY SHOWCASES LOCAL TALENT IN ITS 16th ANNUAL FUNDRAISING GALA BIG BAND BASH A NIGHT OF FOOD, WINE, DANCING AND THE BEST BLUES & JAZZ PERFORMERS IN THE REGION! Today, the Salisbury Symphony announces details for its annual BIG BAND BASH, which will take place at Catawba College on Saturday January 6, 2018. This year’s fundraiser celebrates the music of Pearl Bailey and Ella Fitzgerald and is themed “First Ladies of Swing”. Now in its 16th year, the BIG BAND BASH is given by Charles & Rachel Oestreicher Bernheim in honor of Bert Oestreicher. The gala will commence with a concert of jazz & blues featuring members of the Salisbury Symphony Orchestra and special guest artists from the area under the baton of David Hagy, which will take place at 6.30pm in Hedrick Theatre. The Salisbury Symphony is delighted to announce vocalists Pat “Mother Blues” Cohen, Teresa Moore-Mitchell, Alexis Greer, and Rebecca Stinson, all of whom are residents of Salisbury, will be performing with the orchestra throughout the evening. Cohen, internationally recognized as one of the leading blues interpreters of her day, performs regularly across the globe at music festivals in Europe, South America, and the United States. Moore-Mitchell has an esteemed career in classical music, having performed with world-class ensembles such as the New York Philharmonic, New England Philharmonic and Opera Carolina. Greer, who works with the Rowan Salisbury School System, moonlights as a jazz soloist and has received high praise for her performances, which include roles with Piedmont Players. Stinson, has performed locally with numerous organizations including appearances with Chickweed, the Salisbury Community Choir, Livingstone College, and at special events at the V.A. Immediately following the concert, from 7.30pm in Crystal Lounge, guests will be treated to a seated meal, open bar, and a night of music by the Salisbury Symphony and featured soloists. Dancing is encouraged. B&B Catering, back by popular demand, are presenting a fine-dining Winter Comfort Food menu with selections that include Sous Vide Tender Sliced Flank with Heirloom Chimichurri, Sun-dried Tomato and Feta Stuffed Chicken, Smoked Salmon Spoon with Dill Mayo, Bacon Crisps, Fresh Baked Bread, Grilled Local Veggies, Carmel Apple Pie, Crème Brule Cheesecake, and more! There will also be an open bar with wine provided by the Salisbury Wine Shop. Join us for a special night out and support the Salisbury Symphony while doing so! Benefactors receive special listing in the program and a table for eight for $1,200; Sponsors receive special listing in the program and a half-table for four for $600; Contributors receive special listing in the program and receive two tickets for $300; single tickets are available for $125. Please visit www.salisburysymphony.org or call 704 216 1513 to book. Today, (December 4, 2017), the Salisbury Symphony and Piedmont Dance Theatre announce additional casting for the special 15th anniversary production of THE NUTCRACKER, which will come to Keppel Auditorium on Saturday, December 16th at 6.30pm and Sunday, December 17th at 2.30pm. These dancers have been assembled from around the world by Rebecca and Daniel Wiley, Artistic Directors of Piedmont Dance Theatre. Rachele Buriassi, a native of Sarzana, Italy, is currently a soloist with Boston Ballet and was previously a soloist at Stuttgart Ballet. A prizewinner at the Vaganova Grand Prix in St. Petersburg, Russia, Buriassi will perform the role of “Sugar Plum Fairy”, taking over from Kathleen Breen Combes who was forced to withdraw due to an injury. Yury Yanowsky, a principal dancer with Boston Ballet for over two decades, has performed with numerous companies, including Carolos Acosta’s “Premiere’s Plus” and the Festival Ballet Providence. He has just been contracted as a guest dancer with the Royal Ballet (London, UK) for a production immediately following THE NUTCRACKER, where he will join his sister, Royal Ballet principal Zenaida Yanowsky. As a choreographer, he has created words for Boston Ballet and The Bundes Jugend Ballet Hamburg. Yanowsky is currently on the faculty at Harvard University. He takes on the role of the “Cavalier”. Samuel Chester, a former principal at Carolina Ballet Theatre, has performed across the globe as a freelance dancer, with companies that include Charlotte Ballet, Hilton Head Dance Theatre, Barrend Dance Centre, Griffin Ballet Theatre and Teresa Carreno Teatro in Caracas, Venezuela. Chester will be performing the roles of “Snow King”, “Spanish Chocolate” and “Mother Ginger”. David Greenberg, has performed with Columbia Classical Ballet and then went on to perform with the Charleston Ballet, Hilton Head Dance Theatre, New York Theatre Ballet and American Repertory Ballet. Greenberg will perform “Soldier Doll” and “Russian Trepak”. Emily Bowen, a former soloist with the Houston Ballet, has performed works with world renowned choreographers including Balanchine, McMillan, McGregor and Duato. She currently is on the faculty at Piedmont School of Music & Dance and will perform the role of “Grandmother” and “Spanish Chocolate”. Salisbury Symphony Music Director, David Hagy leads the Salisbury Symphony Orchestra in the only production of THE NUTCRACKER in the entire region that uses a full 49-piece orchestra. Today (Monday, November 13) the Salisbury Symphony and the Salisbury Symphony Chorale presents their first holiday concert of Christmas excerpts from Handel’s ever-popular MESSIAH. The concert will take place on Tuesday December 19 at 6.30pm at First Presbyterian Church (308 W Fisher Street). This concert is part of the inaugural season for the newly-formed 40 member-strong Salisbury Symphony Chorale, which has already earned a reputation as a leading choral society in the region following their highly acclaimed concert with St. John’s Lutheran Church as part of the celebration of the Reformation’s 500th anniversary. Soloists for the MESSIAH are University of North Carolina School of the Arts-trained soprano Anyée Farrar, alto Alden Pridgen, tenor Logan Weber, and bass Eric Powell. Virginia native Farrar has performed roles in Dido and Aeneas, The Medium, Anna Bolena, Cosi fan Tutte, Hansel und Gretel, and currently studies with Dr. Marilyn Taylor. North Carolina native Pridgen has performed with role in Madame Butterfly, Tosca and The Flying Dutchman for Piedmont Opera in addition to roles from La Rondine, Die Fledermaus, The Tales of Hoffman, and the Consul with the A.J. Fletcher Opera Institute. Webber, from Colorado, has performed numerous roles with The Colorado College Vocal Arts Symposium, Colorado Springs Fine Arts Center, Opera Theater of the Rockies, the A.J. Fletcher Opera Institute, Piedmont Opera, Ash Lawn Opera, Chautauqua Opera, the Rural Artists Project in Alaska, the American Institute of Musical Studies program in Graz, Austria, and the Maryland Opera Studio. North Carolina native Powell has performed South Pacific, Rigoletto and A Little Night Music with Piedmont Opera and frequently performs with the Winston Salem Symphony. Music Director David Hagy will conduct this concert, which also features an 18-piece orchestra. MESSIAH features some of the most recognizable hits in the classical canon, including the soprano arias "Rejoice," and "How Beautiful Are the Feet," the alto's "O Thou That Tellest Good Tidings to Zion" and "He Shall Feed His Flock," the tenor recitative "Comfort Ye" and aria "Ev'ry Valley," the bass' "The Trumpet Shall Sound," and the Chorus'And the Glory of the Lord," "For Unto Us a Child Is Born," and, of course, the famous "Hallelujah” chorus. Tickets for the MESSIAH are $15 for adults and $5 for ages 18 and below. Children under 10 years old get free admission. Seating is general admission. Tickets can be purchased online at www.salisburysymphony.org, or over the phone at 704 216 1513. PIEDMONT DANCE THEATRE & SALISBURY SYMPHONY JOIN FORCES TO PRESENT THE HOLIDAY BALLET SPECTACULAR THE NUTCRACKER A FESTIVE TRADITION NOW IN ITS 15th YEAR! Back by overwhelming demand, the Salisbury Symphony and the Piedmont Dance Theatre have announced their collaboration to bring Tchaikovsky’s iconic ballet THE NUTCRACKER to Keppel Auditorium this December. The much-loved holiday ballet continues to break box-office records for Keppel, reaching 100% capacity for three years running. This seasons’ performances will be held on Saturday, December 16th at 6:30pm, with a matinee performance on Sunday, December 17th at 2:30pm. Now in its 15th year, with a new cast from Piedmont Dance Theatre’s troupe and in a revised production as conceived by Marius Petipa, THE NUTCRACKER is choreographed by American Ballet Theatre alumna and internationally acclaimed dance star Rebecca Wiley and Juilliard-trained Daniel Wiley, named by Charlotte Magazine as the city’s “Best Male Dancer”. To celebrate the production's 15th anniversary, THE NUTCRACKER will showcase guest dancers Kathleen Breen Combes performing the role of the ‘Sugar Plum Fairy’ and Yury Yanowsky as the ‘Cavalier’. Ms. Breen Combes, a principal dancer of 15 - years with Boston Ballet, has been hailed by The New York Times as a "ballerina of colossal scale and boldness." Mr. Yanowsky, a 22-year veteran with Boston Ballet, has danced many lead roles with the company and is an award-winning choreographer. Piedmont Dance Theatre has earned a reputation across the state for their high-level of training, with soloists from recent THE NUTCRACKER productions now performing with the Boston Ballet, Nashville Ballet, Hubbard Street and Cincinnati Ballet. Attending the THE NUTCRACKER this December provides a rare opportunity to see some of the nation’s finest dancers on stage before they launch their careers. Today (Sept 28) the Salisbury Symphony announces innovations to its Season Premiere Concert on October 21st that will provide the most inclusive concert-going experience for the broadest possible audience. In addition to the traditional concert experience, where audience members will watch the concert from Keppel Auditorium, the Salisbury Symphony will incorporate a Pop-Up Bar presented by Morgan Ridge, an exhibition by Rail Walk Artists, and a live relay of the concert from Keppel to Crystal Lounge (aka ‘The Lounge’) - catering to all types of musical engagement. ‘The Lounge’ will open at 5.30pm and will be the home to Morgan Ridge’s Pop-Up Bar, which will serve wines, beers, light snacks and sodas throughout the evening. There will also be a large screen set up in ‘The Lounge’ that will transmit the concert taking place inside Keppel Auditorium, for those who would prefer watch the concert in a more informal and social environment. This initiative is part of the Salisbury Symphony’s renewed commitment to serving the entire community. As such, the Symphony is offering complimentary tickets or discounted rates for groups, with multiple community organizations already taking part. The Season Premiere Concert will feature Music Director David Hagy leading the Salisbury Symphony in Bach’s “Brandenburg” No. 3, Brahms’ Symphony No. 3 and Beethoven’s “Eroica” Symphony No. 3; three of the most popular symphonic works. Special thanks to Charles & Rachel Oestreicher Bernheim for sponsoring the concert. Community groups are eligible to receive discounted or complimentary tickets. Please contact director@salisburysymphony.org or call 704 637 4314 for details. For tickets and details visit: www.salisburysymphony.org. After 50 successful years, the Salisbury Symphony is re-branding itself to reflect its role as a source of great entertainment and its emphasis of serving the entire community. We now have an exciting opportunity for local students, artists, graphic designers, or anyone with an idea (!) who would be interested in submitting designs for our new logo and a chance become part of our history. Submissions should be in JPEG or PDF format. PRIZE: Lifetime membership to the Salisbury Symphony - exclusive invitations and season tickets for you and a guest. Today the Salisbury Symphony is delighted to announce that it will be the Town of East Spencer’s first Arts Partner. The partnership will focus on music engagement with the East Spencer community beginning with a 12-week pilot program of learning how to play the violin. This program will be made available to the entire East Spencer community, from ages eight and above, and will take place at 1909 East, East Spencer’s newly acquired facility (the former Salisbury Education Administrative building located at 110 S Long St), once a week starting week commencing September 25th. Dr. Lynn Bowes, the Symphony’s Education Director, will oversee the program. For more information or to sign-up for the program, please email: education@salisburysymphony.org. Space for the program is limited. Music education is a key component of the Salisbury Symphony’s mission and as such the organization will be expanding their music education program to reach out to communities and individuals who might not otherwise be exposed to orchestral music. Music programs like this provide a supportive environment that promote acceptance and creativity, and involvement in music education programs provide positive personal, social, and motivational effects in anyone’s life. Salisbury Symphony’s Education Director, Dr. Lynn Bowes, says: “Music speaks to so many people and breaks down boundaries we put on ourselves. Learning an instrument, at any age, is fundamentally enriching to a person’s life. I am proud and excited for this opportunity provided by this partnership for the community of East Spencer. Upon the building’s purchase earlier this year, East Spencer had earmarked the auditorium to be used as a community arts center. This is part of the town’s new initiative to produce special programs aimed to enrich its community. Additional Arts Partners will be announced in due course. For more information about the Salisbury Symphony’s education programs, visit: www.salisburysymphony.org.